Last week I received an unexpected package. I hadn’t ordered anything online recently, yet here was a rather large box from a company I’d never heard of, FunkyChunky. 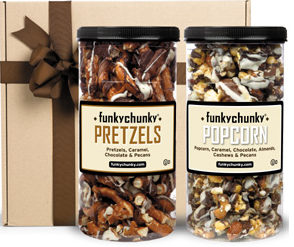 When I opened it, I discovered two giant-size jars filled with chocolate-coated popcorn and pretzels. There were THREE kinds of chocolate. My kind of treat. I couldn’t wait to see who’d sent it. But alas, there was no card inside. It was the start of the Labor Day weekend, and I discovered that FunkyChunky’s offices were closed for the holiday. So I had to wait 3 days to find out the name of the mystery gift-giver. And when I found out, I was tickled…but not totally surprised. That’s because I know that Robert Skrob has learned one of the most valuable lessons in life…the importance of saying Thank You in a special way when someone else does something nice for you. You see, I’d recently bought and read Robert’s new Book, Your Association Shortcut, and I was so impressed with what I learned from studying it that I decided to write a review on Amazon. I emailed Robert a copy of my review and gave him permission to use what I said on his website or in other promotional material. As a business owner, I know the importance of testimonials from satisfied customers. I’ve known Robert for a few years and have always appreciated the quality of his work. I was simply looking for a way to help out a colleague. I did not expect anything in return. But Robert is not like most people. He’s a savvy businessman and terrific human being. He understands at a very deep level the importance and power of acknowledging people who go out of their way to do something nice for him. And so, he didn't take what I did for granted. And he didn’t settle for an email thank-you or even a hand-written note. He sent a special gift that I was sure to enjoy…and remember. When others perform an act of kindness or thoughtfulness for you, how do you express your appreciation? Or do you even thank them at all? Whether it’s a business or personal situation, you’ll make a strong, positive impression if you find unusual or unique ways to acknowledge what the person has done. Life is all about relationships. You’re either strengthening them by what you say and do, or you’re allowing them to weaken. Starting today, make a point to notice the positive things other people do for you, and find a way to express your appreciation in a way that makes them feel good. And there's an added benefit. YOU will feel good, too.